Fascination with stones and trees is just not something you would imagine yourself doing until you’ve been to Ta Prohm. Get your Angkor Pass ready and you’re good to go! 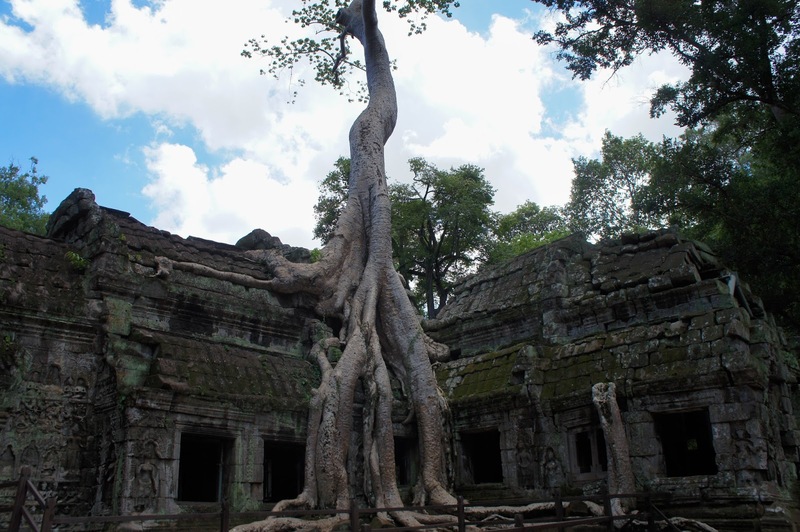 A short walk down dirt path lined with willow trees and Cambodian instrumental music and there’s Ta Prohm! 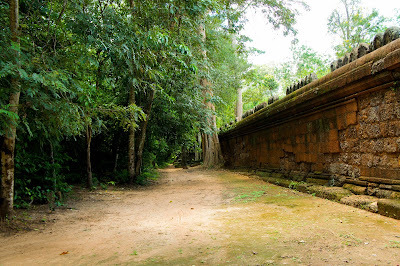 When I got to Ta Prohm, I had to choose between the short express route and the long scenic route. 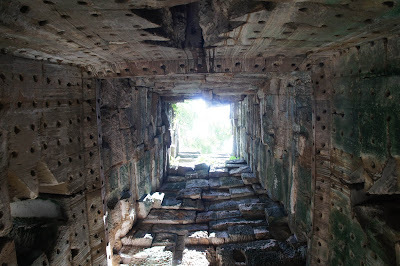 Truth be told, I wasn’t very keen to explore because I was still reeling from the horrible temple fatigue from earlier. But the noisy tourist group did no favours for the short express route, so I took the long route. I’m glad I did. Along the dirt path, I’ve got a reddish brown wall overgrown with moss on my right side. I freaking love the moss wall. 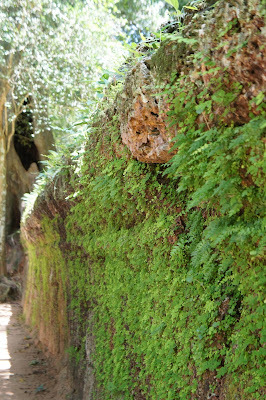 I have no idea why, and I might be a tad bit disoriented; while I was walking, I stared at the moss wall like a stoner. 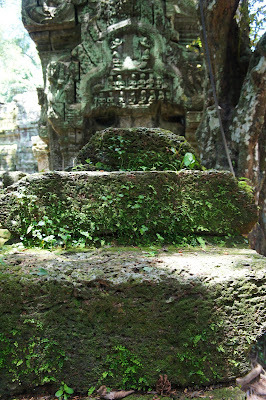 Moss doesn’t only cover the walls though, moss pretty much ruled the whole temple. There’s moss on the slabs of stone by the temple, on steps, on statuettes carved on the wall; nothing can stop these little buggers from growing. I think it’s pretty awesome. 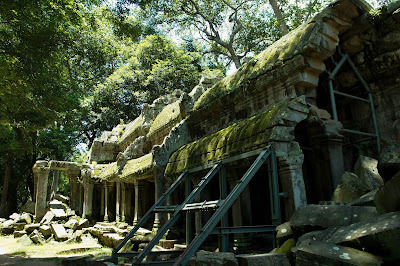 It gave Ta Prohm a greenish hue. 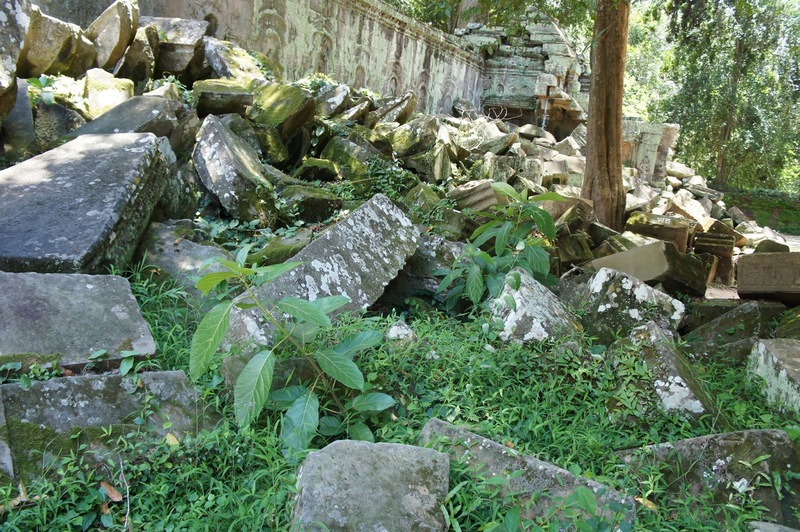 Tons of leafs and stones to stare at! 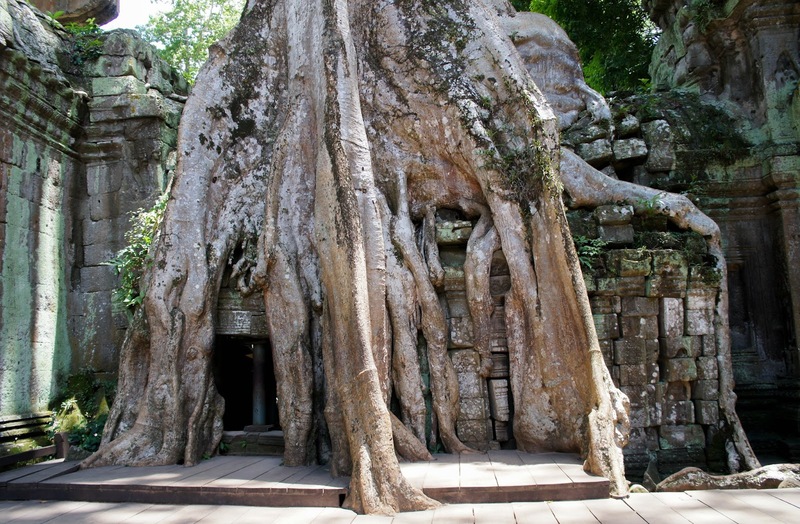 Ta Prohm is definitely more about the trees than the temple. 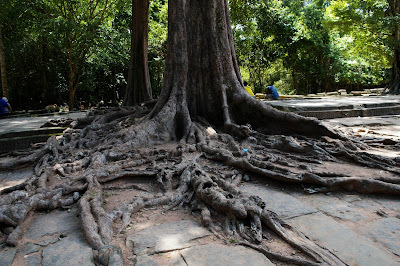 Ginormous trees are everywhere in the temple grounds. 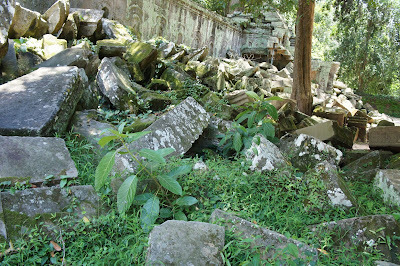 Some of the trees grew on the rooftops and eventually broke through the temple roof. 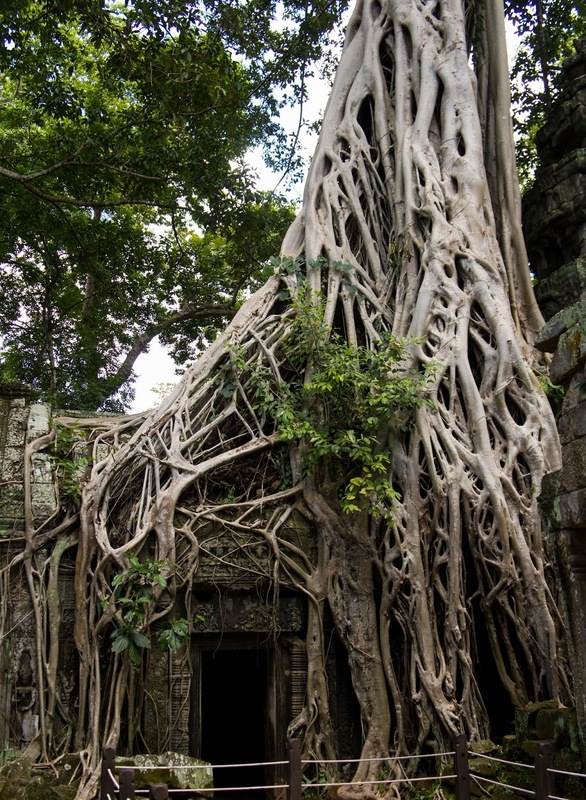 Some seem to split their trunks into long thin roots and wrapped the whole building with a intertwined web-like pattern. 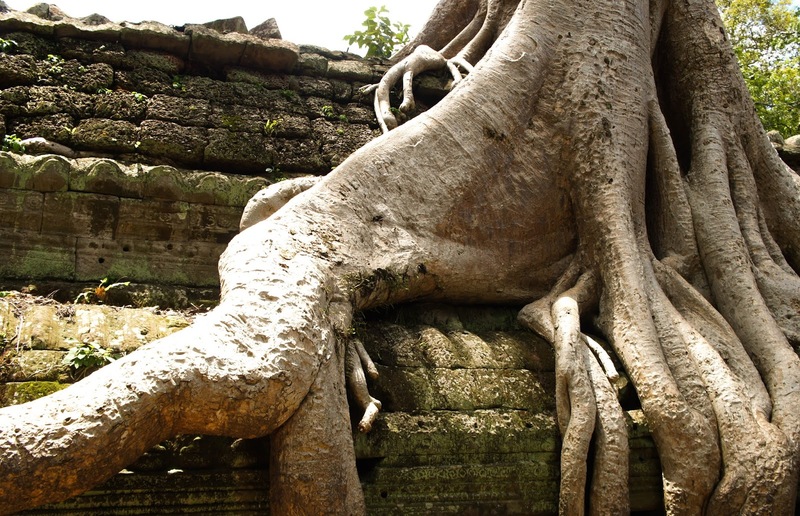 Some trees from the forest stretched their roots over the outer temple wall and grew towards the temple with their roots exposed. My favourite are the ones with the Davy Jones beard. Truth be told, I didn’t care for the Tomb Raider tree. I was so star-strucked -if you could feel like you met Jennifer Lawrence by looking at trees- by the impressive trees I’ve seen, I was a teeny bit disappointed by the Tomb Raider tree. It was still a grand sight, though; I just don’t prefer it. 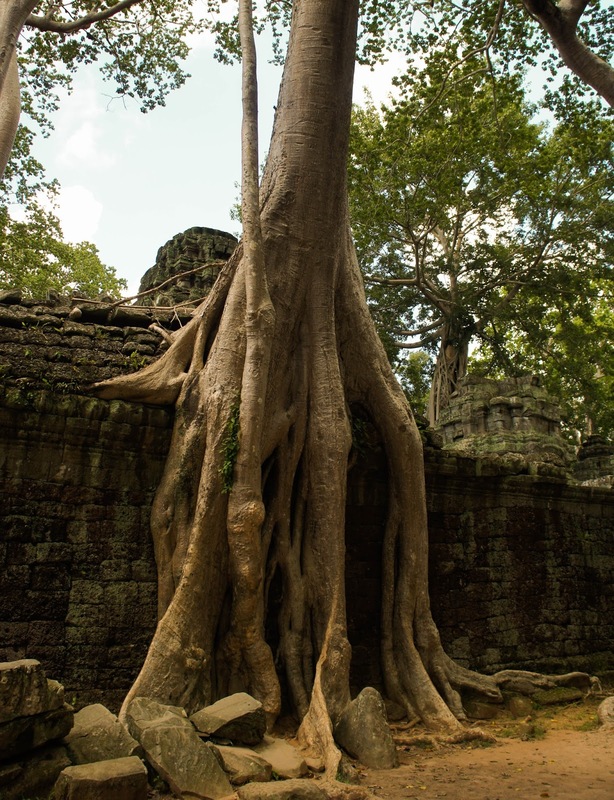 Although there’s no climbing or swinging on vines, walking through the temple can be a bit of an Indiana Jones experience. 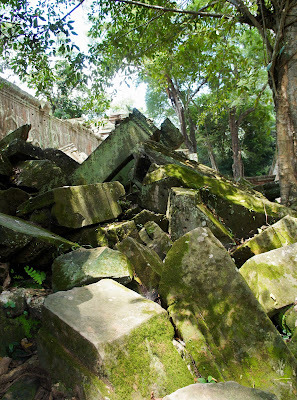 Sometimes as you’re walking through walkways, you might find yourself blocked by rubble. 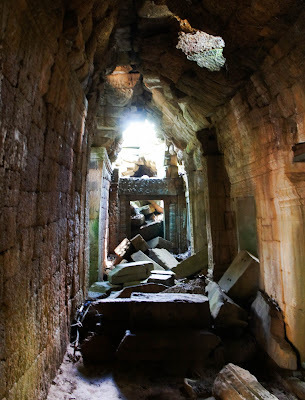 Sometimes, you’d find an unlit tunnel, with only the sound of leaves crunching beneath your feet and the sound of your own heartbeat as company. I remember edging myself into a really narrow slit between two crumbling walls and discovered a courtyard of rubble. 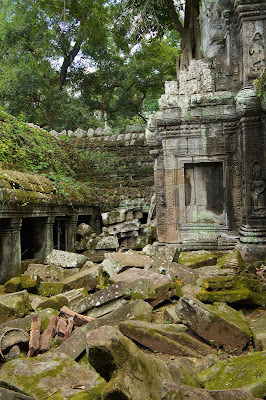 Light bathe onto the moss covered stones and tiny dust particles floated on the air. It’s an enchanting image, one that my camera cannot capture. Don’t lose that adventurous spirit and you’ll find yourself pioneering the discovery of your very own secret spot. Echo caves. Thump your chest here to hear it the hollow sound. One of my favourite spots! 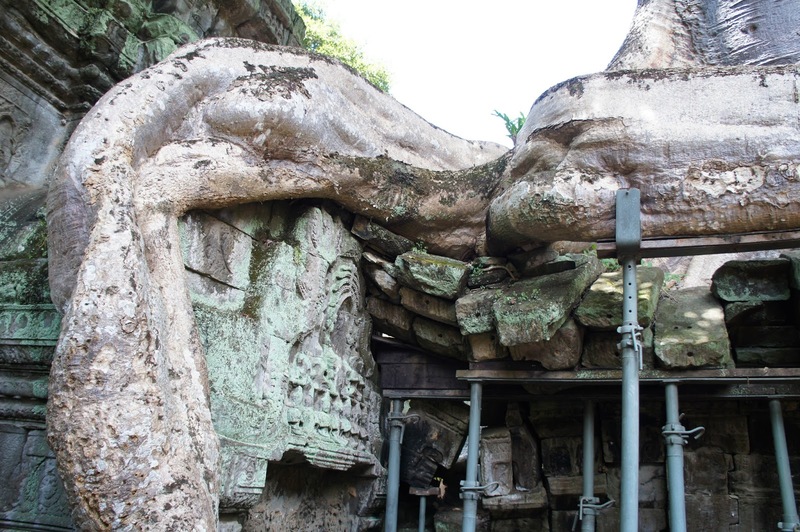 Now, Ta Prohm is a fusion of ancient modernity. With columns cracking and passageways collapsing, it’s time for modern construction to intervene. 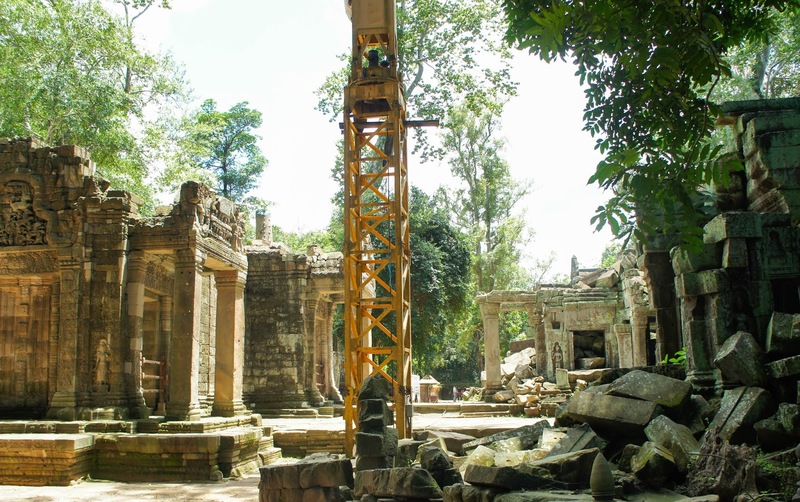 Modern machinery can be seen here and there in Ta Prohm, thanks to the collaborative effort between India and Cambodia to restore it. The old temple’s fighting a losing battle against nature. Trees are crushing the aged stones with their sheer weight; trees can grow even bigger, but stones can’t get stronger. Metal contraptions that held up the humongous tree roots. My experience there was serene and spiritual. When one is surrounded by forests and with birds chirping in the background, one just has to walk slower and to be in the moment. It was more than relaxation. 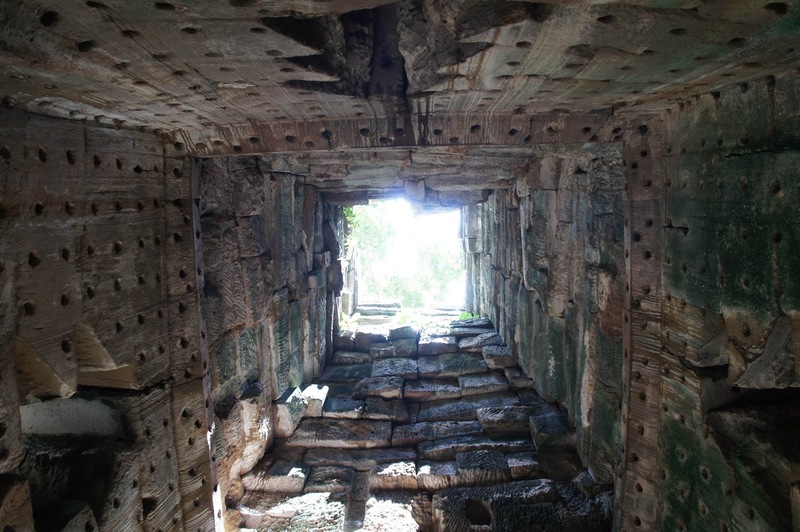 The peace and quiet allowed me to be immersed in my thoughts, and inspired new ideas. It’s a leisurely afternoon stroll full of deep philosophical thoughts, made even more perfect by a picturesque little temple. What a peaceful place, feel calm when walk here. 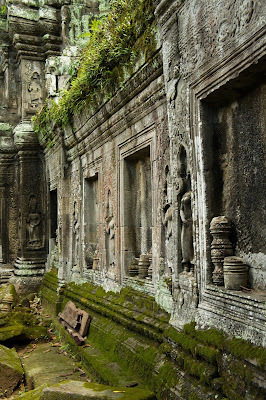 This is definitely one of the most charming temple in the world. your photo very nice!!! 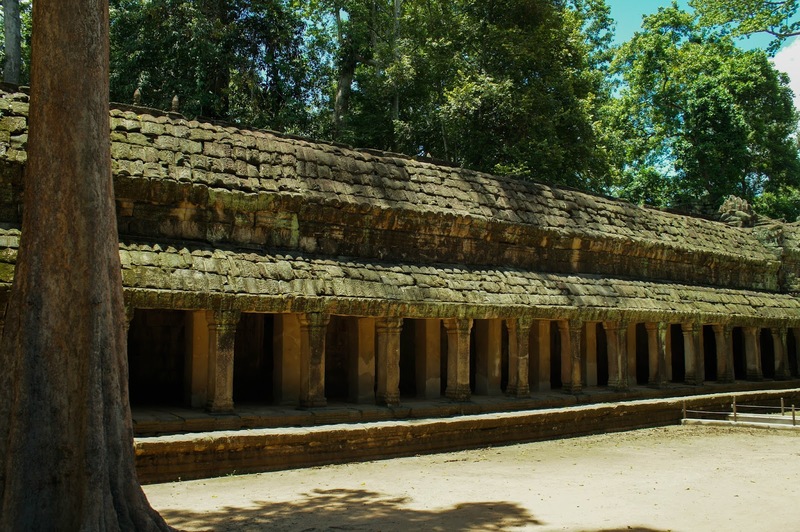 I like the historial places!!! 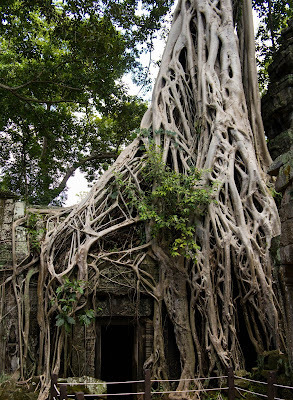 i think i need to have a visit at Ta Prohm.. The place look so calm and nice! I'm gonna visit this place by next year! MUST VISIT! One of my favourite site in Siem Reap! Its beautiful and look so meaningful to me. 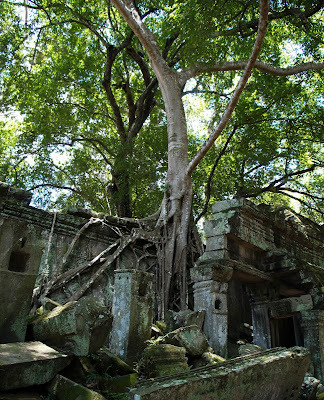 This place is beautiful and it still maintain the design and remain natural. Feel so peaceful. Thanks for sharing about this beautiful place. Hope I have a chance to visit it soon. I will share this post with any friends going to visit Angkor. Never do a Tomb Raider pose at the tree? LOL. Nice to see the place is beautifully kept. Yeap. Have you got any favourites? Hahaha come! It'll be great! 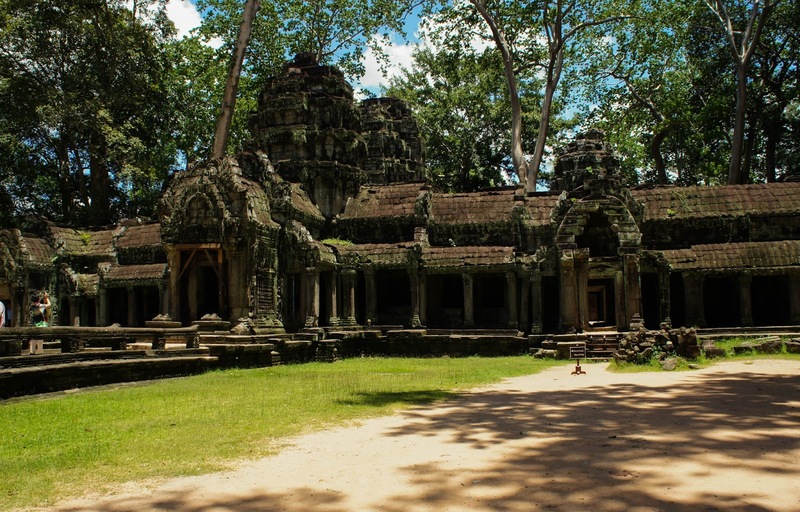 Definitely a must visit if you're visiting Angkor Wat. Yeap, I thought I got a little bit of a sadness kinda of vibe, but I love it nonetheless. Yeap. One of the best kinda feelings in the world. It is! You can't imagine what I looked like when I entered. It's just breathtaking. Just a smidge. It's always great to find new secret spots. 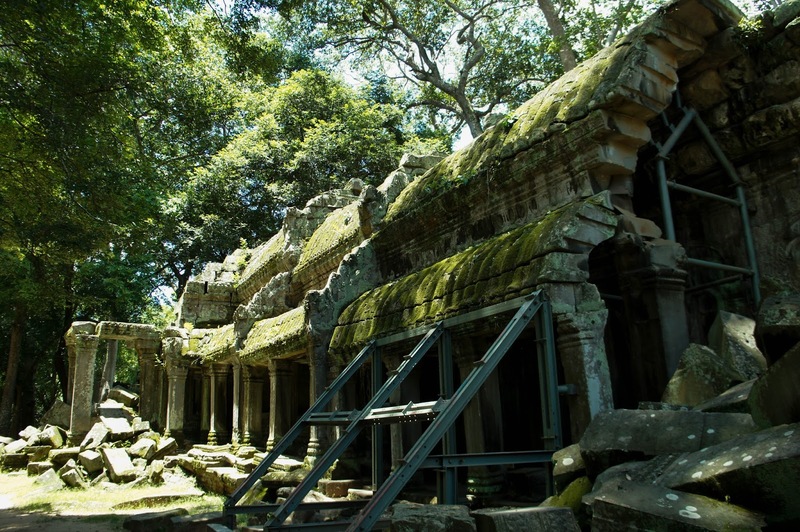 I love nature and this temple surrounded and wrapped by nature sounds and looks to enchanting! Omg this place is so amazing. So serenite and full of old very old trees and history. Should visit it. Great job to those preserving the nature. Hopefully it will stay around longer so that the younger generations can learn about it personally and not from books. 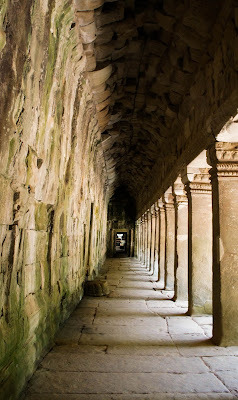 Cambodia is on my list from a long time and every time I saw a photo i find it more fascinating.